This gluten free, low carb French Toast is so amazing, you’ll forget you were supposed to feel guilty. Coat two oopsies w/ egg mixture and fry in butter like french toast. I had two this am w/ butter and SF pancake syrup (*cleo’s note: Davinci’s hazelnut syrup rocks) and 2 breakfast sausages – YUMMO!!!! ** Laurie uses sweetzfree, but Jenny omitted Sweetzfree and said the recipe was sweet enough, so if you don’t have any, you’ll probably be all right. I will definitely be making this for breakfast this weekend! It looks YUMMY! ps. thank you so much cleo for posting all these awesome recipes for the oopsies! i love your blog and there’s always something new for me to try out! thank you again! Thanks so much for being so kind! I am so disorganized, and it’s so nice that people want all of the oopsie recipes in one spot so people can find them easily. Lowcarbfriends.com has been so extremely supportive and helpful trying to keep all of the oopsie excitement to particular areas, and this helps me to locate everything so that I can brag on the recipes (and their creators)! I love the french toast, and it seriously tastes just like french toast. The davinci’s impresses me as well. Who knew hazelnut would actually taste like maple syrup? You are brilliant! Ever since I have used your oopsie recipe it’s like the low carb heavens have opened up. I can have true egg salad sandwich ( yeah I said it sandwich). Anyway tried ur french toast I used a dollop of ricotta cheese sprinkled with cinn. and slim sweet(lo han),super amazing. I check ur blogg daily. Love it. Thank you so much for your feedback and kind words! I’m so glad you check back! I’ll definitely be updating all this week with new recipes and pieces! I need to make more oopsies tomorrow… I’ll also be making broccoli cheese soup and will have pictures of that as well. Fantastic! I applaud your ingenuity, and loved the feta recipe as well. I have been craving pancakes and this looks like it will do the trick! This recipe is to DIE for!! I didn’t have any lc syrup so I melted 1 tbsp butter and put in 1/8 tsp of Mapeline, and dusted my “french toast” with a little splenda then poured the syrup over it. I’m in heaven! You are a Goddess, Cleo! My husband and I started lo carb a couple weeks ago. First try at the oopsies didn't go so well…I didn't beat the whites firm enough. Ever since them I'm like an oopsie factory. I even got my husband to make some! Tomorrow I'm trying the french toast with DaVinci's sf strawberry syrup. I can't wait until morning! OH MY! These are even better than the traditional french toast recipte. Very filling, and rich taste, too. THANK YOU, goddess of the lighter side…you have given me back my buns -for sandwiches, of course! as well as my favourite breakfast. You rock. May the syrup be with you, Wildgeraniums. And the buns. Thank you thank you thank you. These were super yummy! My 4 year old daughter loved them too. In fact she was disappointed when we ran out 🙂 Wasn’t sure if I could get the Oopsie roll recipe right since I baked them on my Pampered chef stone, but they turned out wonderfully. Will definitely be making these again. Excellent, LuAnn! I didn’t know they could behave on a stone. You rock! I am so glad the French toast was a hit. Four year olds are some of the best food critics out there, so pleasing them means you’re golden. I honestly can’t be more overjoyed over these oopsies, they are so satisfying and so versatile. I just made the french toast this morning and I felt like I was eating pancakes, which is a blessing all in itself. I’m getting so many ideas from this site, thank you so much this alone makes it possible to stick with low carb living! I am so happy you like them, shadow! I really appreciate you taking the time to send me such kind feedback and thoughts. For those of you like me who have to get up way too early in the morning and just want something fast for breakfast. The oopsie french toast microwaves really well. I made extra on purpose so as to see if they would hold up well and they did Yay! A quick and easy 5 am breakfast. I will be trying oppsies for the first time this weekend and this is definitely on the menu as well. Oh my goodness, to think if my oppsies turn out great, boy oh boy, burgers here I come! The oopsies really made a difference for me in the beginning. I was so sick of lettuce wraps I could plotz. Kathy, I am so glad! When my friend Amy came up with the recipe, I was like, “Really? You can do that?” She is pretty fabulous. She made me a true French Toast believer. I would count these at 2 carbs each to be more than safe. That’s assuming there is 1.5 in carbs per slice and adding in the cream cheese. how much vanilla and cream? Hi, Megan. It’s to taste. You’ll add maybe a tsp of vanilla, closer to 3 Tbsp+ of cream. 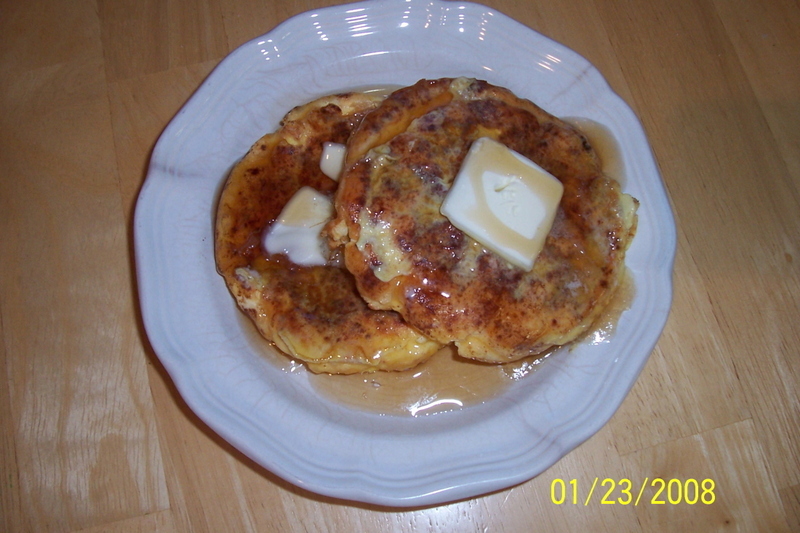 These were great with Mrs. Buttersworth sugar free syrup. The Davinci’s is really hard for me to find, its just super small bottles around here and for the price it’s not worth it! I am so happy to hear that! Thank you so much for taking the time to let me know! Everything I have made with oopsies feels like a cheat to my mind. I was making a sandwich this morning and I kept thinking ‘you shouldn’t be doing this!’ But I can, because oopsies are a low carb dream 🙂 The french toast tastes like french toast. Win. This sounds amazing. I can`t wait to try it. Yesterday, my Doctor told me I HAD to go on a low Carb diet. When I got home, I got on my trusty computer and found you. I am soooo happy that I did. But I must confess, I am 79 years old and I have never heard of an Oopsie. I simply cannot wait to make them. I plan to make them for dinner this evening – Can’t Wait. I will let you know how they turn out. Thanks again for your great site.